Ready for Easter? 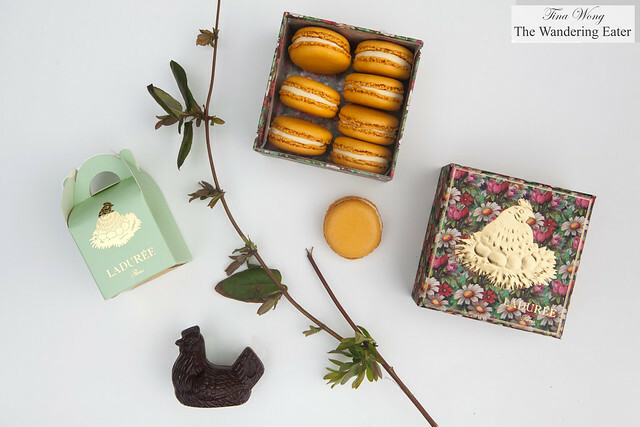 If you are wondering what beautiful, luxurious sweets to serve for Easter brunch or dinner, the famed Parisian brand Ladurée is your best bet. They are currently offering an Easter (or more appropriately, spring) themed pastry called Pâquerette (seen at the header of this post; in French, pâquerette means daisy). This delicious, sweet-tart pastry filled and soaked in passion fruit and yuzu, layered with lemon and hazelnut flavored biscuit. The abstract daisy topper is made of thin chocolate and dotted with passion fruit and yuzu curd. Of course, there must be a seasonal macaron flavor from this legendary macaron house. This Easter, it is the lemon passion fruit macarons ($2.80 each). If you want the coordinating spring themed box with your macarons, the multicolored “Pâquerette” mayflowers and in the center a beautiful golden goose with her golden eggs (filled with 8 macarons, $26) is it. Vibrant yuzu and passion fruit flavored cream filling encased in a perfect, marigold yellow macaron shells.